Two large birds in an open area of ground, one just taking off. To the left can be seen the hut of a homestead. 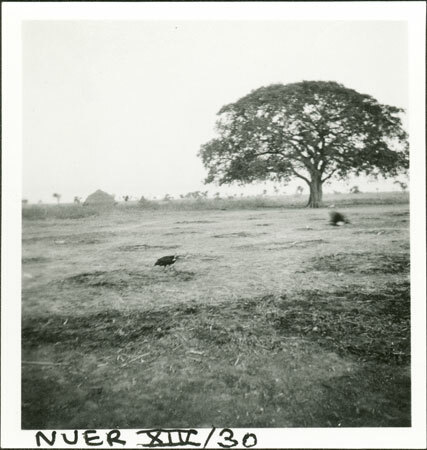 The location is noted as Pathai (probably modern Fathai) on the road from Akobo, the route that Evans-Pritchard seems to have followed to western Nuerland in 1936 after completing a survey of the Luo in Kenya. Note on print reverse ms pencil - "7 72 Pathai" & print front border ms ink - "NUER XIV/30"
Morton, Chris. "Birdlife in Nuerland" Southern Sudan Project (in development). 03 Jan. 2006. Pitt Rivers Museum. <http://southernsudan.prm.ox.ac.uk/details/1998.355.665.2/>.